the nytpicker: NYT Vs. NYU! 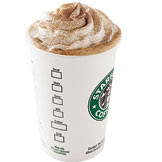 Pulitzer-Winning Reporter Declares War On Journalism Prof Over Lack of Cinammon At Starbucks. NYT Vs. NYU! Pulitzer-Winning Reporter Declares War On Journalism Prof Over Lack of Cinammon At Starbucks. It seemed innocuous enough to us -- or to anyone who has searched for cinnamon to top off an overpriced latte at America's most annoying foamagerie. Except maybe to NYT Pulitzer Prize-winning reporter Don Van Natta Jr.
At around 10:00 pm last night, Adam Penenberg, an NYU journalism professor, turned to Twitter to file a 140-character complaint against everybody's favorite retail punching bag, Starbucks. "Dear @Starbucks," Penenberg wrote. "At $4+ a grande cappuccino, you should never run out of cinnamon or cocoa powder, yet many of your NY locations do. #cmon." If you whine here about nonsense-- like no cinnamon at @Starbucks -- you get unfollowed. Adios, @Penenberg. At which point, apparently, Van Natta deleted Penenberg from his Twitter "follow" list. Ouch! Seems like an outsize response to a fairly standard Twitter feed, especially given the fact that Penenberg is also a respected investigative journalist -- famous, in fact, for having exposed the fabrications of Stephen Glass at The New Republic while a reporter for Forbes. Penenberg has written books on social media and business, and and has taught at NYU journalism school for several years. Van Natta's excision of Penenberg from his Twitter feed seems especially odd, considering his own constant use of Twitter -- he posts several times a day -- to file his own offhand comments. My World Cup predictions: Spain/Portugal 2018, Australia 2022. Why does @KingJames still call himself "King of Akron?" Is there a South Beach club named Akron? This #Knicks team is almost as cool as Clyde Frazier. Those examples were provided by Penenberg, who told The NYTPicker he was baffled a bit by Van Natta's quick, harsh response. "It's all so silly and I don't know what set him off," Penenberg wrote us in reply to our questions. "If you check out my tweetstream you'll note that I don't usually blather on about the lack of cinnamon at Starbucks. Then again, it's Twitter, not Charlie Rose." After citing the examples of Van Natta's own oddball tweets, Penenberg added: "Nothing wrong with that, of course. Although by the standard Van Natta set for me, I'd recommend he immediately stop following himself, just to be consistent." Penenberg noted on Twitter -- shortly after the Van Natta pronouncement -- that he sees the NYT as being unduly sensitive to outside criticism. He elaborated on that point to The NYTPicker. "When I said it's typical of the Times I was recalling the way the Times sometimes responds to critical coverage--like stories by Michael Hirshhorn in the Atlantic, Mark [Bowden] in Vanity Fair, and others." Penenberg then provided a link to what he described as NYT executive editor Bill Keller's "acidic comments" re Bowden's profile of Arthur Sulzberger. "Some in Times management also don't take kindly to having the paper's online business strategies questioned," Penenberg went on. "As both a fan and critic, I'd like to see the Times act with greater class. Times' management should be able to handle criticism better, not act so thin-skinned. Van Natta's off-his-meds behavior reminded me of that." Van Natta hasn't yet responded to a request for comment from The NYTPicker. Reeeally scraping the bottom of the barrel now, aren't ya? No, Anonymous, he's not. This is hilarious in its own microcosm, but also points to the arrogance of Times staff. Which is why things like the cheerleading for the Iraq war and Jayson Blair happen. Starbucks-related Twitter unfollows are the gateway drug to larger lapses in judgment. This doesn't even rise to being worth critiquing. Maybe these people don't know how to use Twitter. That was a perfect hate retweet moment. Calling it out was silly, but sometimes a dumb tweet is emblematic of larger annoyance. Unfollow whomever you want. You're really degenerating here. Anything to avoid confront issues that matter? Either that, or elaborating on a hyper-local catfight between two insecure grown-ups is worth reading into? Please justify what this is really about or else you are wasting newsreaders' time. I guess I can understand Van Natta...I had to unfollow some other NYU profs for their obnoxious tweets--and attitudes. WTF nytpicker? I loved you. But you've moved over the line of speaking truth to power to lame. You've got an important job to do. Do it! And if you don't have something important to say, don't say it. i gotta agree nitpicker - someone needs to critique the times coverage on a daily basis. if someone is so foolish as to spend his time writing - let alone reading - a twitter feed, then i think he deserves whatever fate has in store for him. your site, however, ought spend a bit of time discussing some of the issues of poor reporting, bias, and poor journalists in the times. to wit: the appointment of a source-hugging media hypist to cover bagdad? and the bizarre self-loathing borderline anti-semitic hanukkah oped? WTF? the commentary on times management towards the end of the post are valid. should have made that the subject of the post. Commenters are strongly encouraged to post additional predictable suggestions/criticisms of nytpicker purporting to uphold some different editorial standard that could conceivably guide some hypothetical, superior, volunteer-run media criticism blog in an alternate universe. Said suggestions/criticisms should ideally take the form of (1)attacking nytpicker for writing anonymously, (2)attacking nytpicker for focusing on issues that the hypothetical alternative blog in an alternative universe would not deem newsworthy, or (3)attacking nytpicker for not focusing on issues that the hypothetical alternative blog in an alternative universe would deem newsworthy. After posting such suggestions/criticisms, commenters are encouraged to return to their day jobs and do absolutely nothing to enact, in a real-world way, the standards of media criticism that ostensibly justify their comments. I am in the "I would like those 60 seconds of my life back" camp.